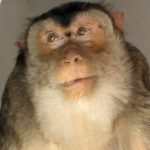 At the time of her passing, pigtail macaque Crunchy was one of the oldest residents living at the Primate Rescue Center. We estimate that she was nearly 40 years old. She spent part of her younger life as a research subject in a laboratory, and then lived as a pet in an office in New Mexico. Crunchy arrived at the Primate Rescue Center in the spring of 1994. She lived with many different monkey friends over the years, but found true companionship with rhesus macaque Dewey. She was very protective of her man, often showing her teeth to anyone who looked at him for too long. Despite her somewhat grumpy first impression, this girl was actually very sweet. She and Dewey spent the majority of their time taking turns grooming each other.The couple was critical in facilitating young Java macaque Carlos’ rehabilitation, and they cared for him as their own. Crunchy was extremely loyal to her friends, including her adopted grandson, Carlos, and protected them all from any perceived threat. Crunchy had an outspoken yet gentle personality, and we will miss her tremendously. Her incredibly long life made an imprint on so many.